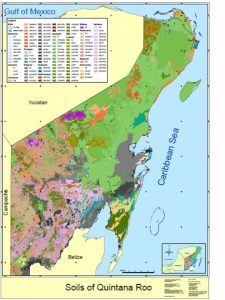 The aim of this work was to develop the digital map of soils for Quintana Roo for a printed scale 1:400000 with 1:50000 work scale data, initially with a geopedological approach and subsequently improved to a digital map. 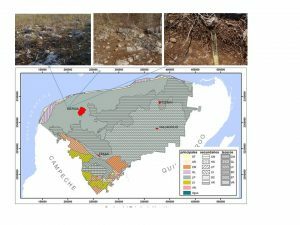 The map was prepared with data from the formative factors of soils using mathematical methods to infer information in the places where these data are not available. Its elaboration included three stages, the first two following the principles of the geopedological approach consisted in the synthesis of the information generated in the characterization of the geomorphological landscapes (vertical dissection, karst geomorphometrics, failures, geology) and soils, in the third stage incorporating the environmental components (climate and vegetation) and related variables through various statistical analysis (cluster analysis, principal component analysis and classification analysis) the procedure allowed to obtain the pattern of distribution of the Soils to finally develop the model and get to the digital map of soils in the study area. Vertical dissection, karstic forms (dolines, uvalas and poljes), karst faults densities, and the flooding regime for karstic, bodies of water, and age of parental materials, explain 65% of spatial distribution of soils from Quintana Roo, Mexico. The analysis of classification denotes that above 83% of soil WRB group assignments are correct. The soil WRB groups that occupies the territory is the Leptosol, Gleysol and Phaeozem, together occupy 75.6% of surface. Other soil WRB groups are Kastanozem, Regosol, Vertisol, Histosol, Solonchak, Arenosol and Fluvisol. The map developed with data from the soil forming factors and associated with mathematical methods to infer information in the places where there are no data is an important input for the decision making process. The index of the vulnerability of the Yucatecan karstic aquifer (IVAKY) is proposed. The IVAKY was built based on a geomorphopedological map scale of 1:50 000, which contains the density and type of karst depressions and soil associations in each geomorphopedological unit. The climate factor is included through the length of the rainy period that considers amount, distribution and intensity of the rain. The three factors (topography, soils and climate) were weighted with the process of hierarchical analysis (AHP) using ArcGis. It was identified that the ring of sinkholes and part of the northeast of Yucatan state have the extreme level of vulnerability, where dominated sinkholes in contact with the aquifer and soil as Nudilithic Leptosols, Lithic Leptosols and Rendzic Leptosols, occupying 19% of the state surface. 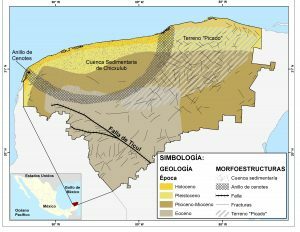 Low and very low levels of vulnerability are located in southern Yucatan in areas of equal or greater than 50 masl, with low to medium density of karstic depressions (uvala and poljes) and Luvisols, Vertisols and Stagnosols associated with Leptosols ( 12% of the state surface). In areas with very high levels and high vulnerability, the general population – including producers, entrepreneurs and decision makers – must be informed and made aware that land use is adequately managed, because poor management or activities intensely productive would represent both potential threats and high risks of pollution. By contrast, in areas with low levels and very low vulnerability, anthropic activities represent a lower risk of aquifer contamination. Finally, the proposed approach is replicable and could be used to assess the vulnerability of aquifers in regions with similar environmental characteristics in Mexico, Guatemala, Belize, Cuba and the United States of America (Florida). Aguilar, Y*., F. Bautista, M. Mendoza, O. Frausto, T. Ihl y C. Delgado. 2016. IVAKY: Índice de la vulnerabilidad del acuífero kárstico yucateco a la contaminación. Revisa Mexicana de Ingeniería Química, 15(3): 913-933. The Soil degradation is a part of total Ecological crisis of due to the Fact That soil is the link of the any Ecosystem. The soil loses its environmental functions (EF ) under the comprehensive loads. One of the key topics of nature protection in the last decade is the evaluation and accounting ecosystem services in human economic activity. Therefore, the search and development of spatial planning tools for areas based on their environmental functions is very important. The article considers the software for evaluation of environmental functions using TUSEC algorithms (Technique for Soil Evaluation and Categorization) and others index. The technique implies a score evaluation of basic environmental functions of natural and anthropogenic soils. Environmental functions evaluation allows keeping a balance of benefits and losses at a spatial planning as a result of lower environmental impacts on soil functions. The central component of the software is a relational DBMS Derby designed in Java using IDE Eclipse. Data on the site, field description and analysis of soil profiles are stored in the database using input tools. Intermediate calculations and evaluation of environmental functions is based on input data by TUSEC models. The forcasting modeling tool allows calculating the change of EF ranks for different types of land use. The evaluation results of environmental functions and predictive models can be presented by graphs. Export of tabular and graphical information is possible as well as the spatial reference data into the GIS. Friendly interface for data input and output and database management is designed for users who do not know SQL query language. Gallegos, A., Bautista F. and Dubrovin I. 2016. Soil and Environment: Software to evaluate the environmental functions of soils. Software & Systems. (In Russian and English), 114 (2): 195-200. DOI: 10.15827 / 0236-235x.114.195-200. Bautista F., A. Gallegos* y A, Pacheco*. 2016. 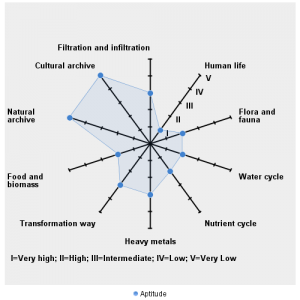 Analysis of the environmental functions of soil profile data (Soil & Environment). Skiu. México D.F., México. 72 pp. Living almost 15 years in karst has allowed me to know the particularities of its soils, its diversity. For that reason, when I see the maps of soil organic carbon content I am horrified to see such great mistakes made by my colleagues, the same feeling causes me to hear or read that the Yucatan peninsula, is the largest store of organic carbon in the soil in Mexico. The organic carbon inventories in the soil in karst areas should be done in a very different way to the way they are being carried out. Discontinuity and spatial heterogeneity should be taken into account at short distances of meters. Soil bulk Density data must be generated and the soil depth not to be used beyond the real depth. The SOC estimation requires quantifying the coarse fraction(stones and gravels), bulk density and depth. The soils inventory realized for INEGI didn´t reports the first two parameters, then, the generated SOC maps have considerable doubt SOC. The objective was to evaluate the spatial variability of soil organic carbon over short distances, as well as to report the contents of organic carbon per unit area in Leptosols from northern of Yucatan Peninsula. 102 samples were taken; organic carbon was analyzed by technique of potassium dichromate; and coarse fragments (coarse gravel, medium and fine gravel) were separated from the fine earth. The Color was recorded dry and wet, bulk density was measured using the amount of fine earth in a volume of 10×10 cm surface by a depth to find the rock. Leptosols presented SOC values below 100 t ha-1 reported for this area, with mean values of 32.85, 37.57, 43.72, and 61.93 t ha-1, for dark brown soils, very dark brown, blacks and very dark grays respectively. Coarse fragments ranging from 6.7% to 96.4% with an average of71.15%. The amount of edaphic organic carbon is in agreement with the values reported in percentage but lower than those reported in unit of surfaces, which is why it is being overestimated. The spatial analysis of the soils at short distances reveals a high discontinuity and variability in the percentage of carbon, as well as in the depth and quantity of coarse fragments. The comparison in the COS content between soils should consider the spatial discontinuity and the amount of COS in kilograms per hectare. In the soil organic carbon inventories in the north of the Yucatán Peninsula, there has been an overestimation of the organic carbon of the soil that must be corrected considering the discontinuity of the soil and its shallow depth. 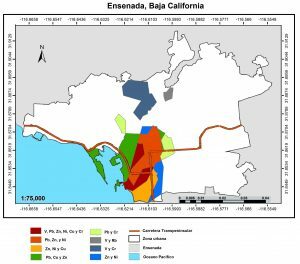 In Ensenada Baja California, ships and vehicles produce particles with heavy metals. These particles are blown by the wind and deposited on the soil becoming urban dust. Heavy metals may affect the health of the population, so a quick diagnosis is required to find a solution to this problem. The aim of this study is to identify those areas of higher pollution within the city. A total of 86 urban dust samples were sampled on diferent substrates (soil, cement and asphalt). Heavy metals were analyzed by X-ray fluorescence. Differences among substrates were identified by analysis of variance. The analysis of ordinary Kriging interpolation (KO) was performed to estimate the spatial distribution of heavy metals. 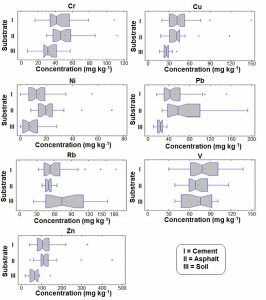 Asphalt contains higher concentration of Cr, Ni, Pb and Zn; cement contains higher concentrations of Cu and V; and soil contains higher concentrations of Rb. A total of thirty six sites exceed the concentration of vanadium established by the NOM-147-SEMARNAT/SSA1-2004. 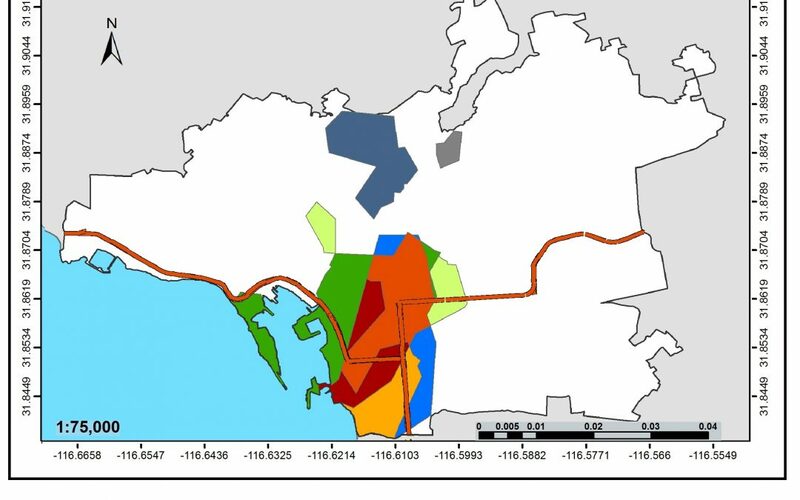 The map which includes the classes with higher concentration of heavy metals shows that the southwest area of the city is the most polluted area due to port and transpeninsular highway. Cortés J.L*. ; F. Bautista; P. Quintana; y A. Gogichaishvili. 2017. Distribución espacial de los metales pesados en polvos urbanos de la ciudad de Ensenada, Baja California, México. Revista Chapingo Serie Ciencias Forestales y del Ambiente.